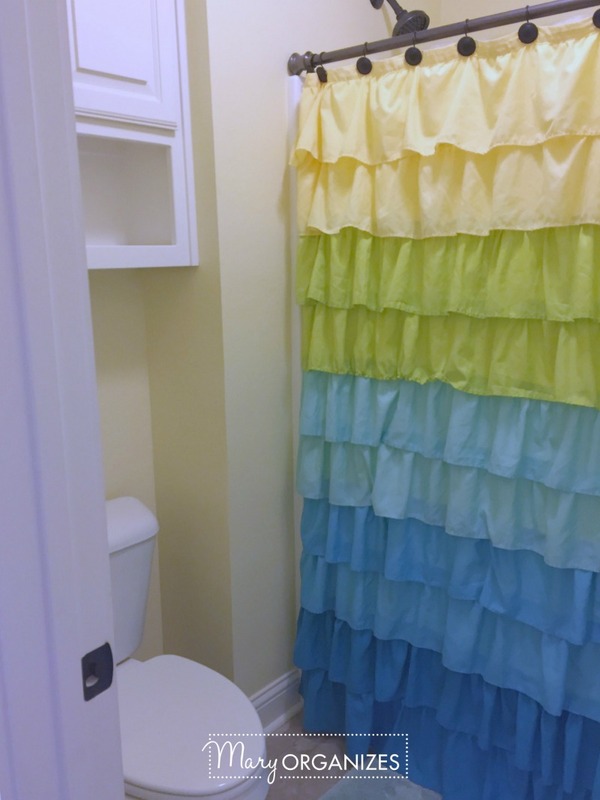 Today I am going to give you a little tour of my girls’ bathroom. 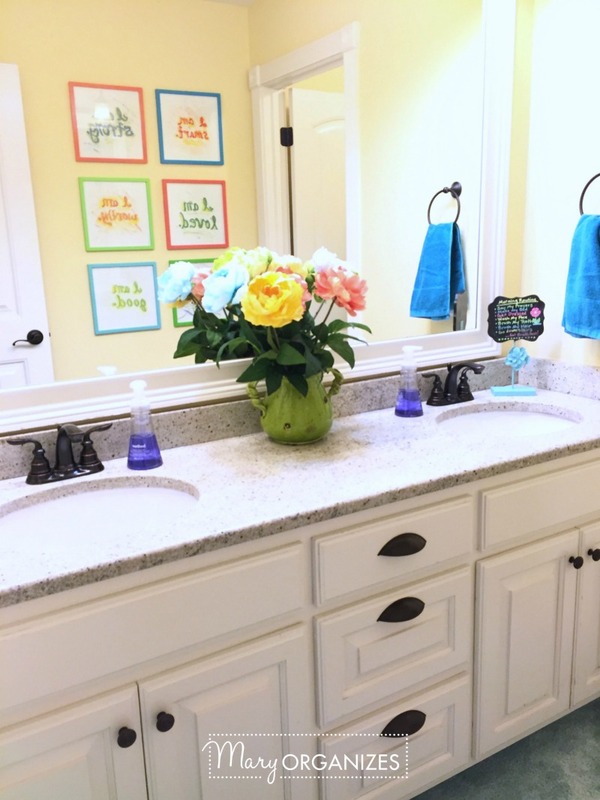 We are lucky enough to have four bathrooms, and this is the third one I’ve shown on the blog. (You can see my Master Bathroom HERE or The Green Bathroom Here.) One of these days I’ll show you the little powder bathroom downstairs (though there was a glimpse of that one in the Mud Area Tour HERE). The girls’ bathroom should probably be called the kids’ bathroom, but my son only brushes his teeth in here so far. He still does all his baths and showers in my bathroom, and I’ll probably keep it that way until he is doing those independently. 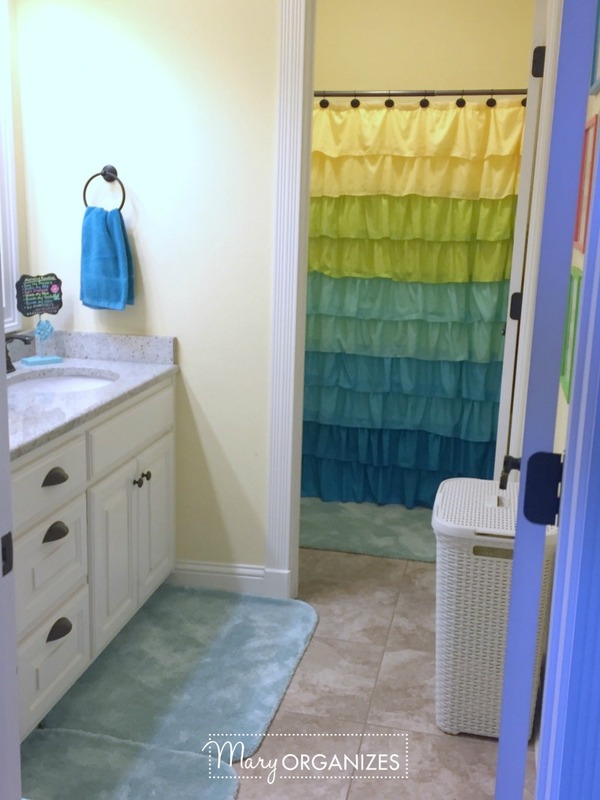 The difference in use between the green bathroom and this one, is that adults almost never use this bathroom, so it really is just for the kids. It wasn’t long ago that we needed step stools at both sinks, and now we just need this one turned sideways like this. My shortest girl stands on the bottom step and my son can stand on the top and still reach the sink while a parent is helping him brush his teeth. I know this picture is a bit blurry, but for some reason I only snapped one picture. This is a little reminder I have up for my girls. I don’t store a ton in their bathroom. 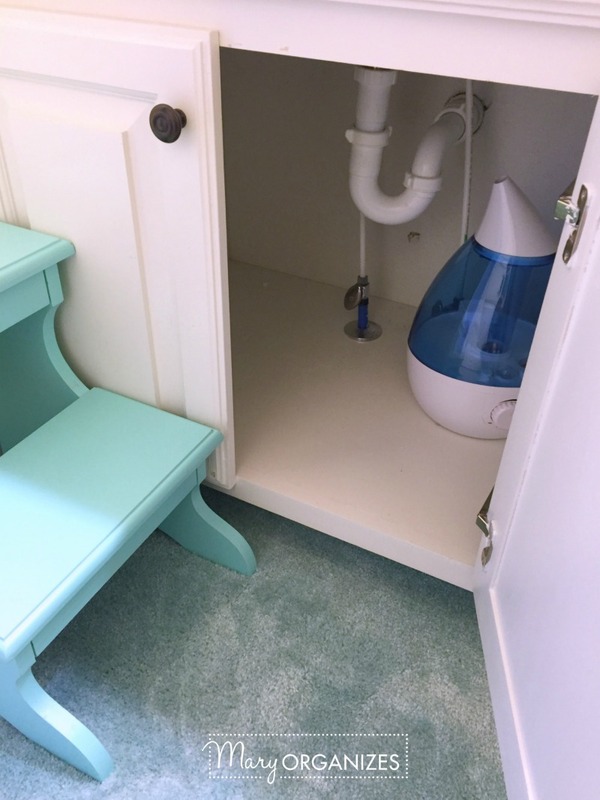 I use underneath this sink for the humidifiers. Right now most of them are in use around the house. It gets really dry here in the winter and really humid in the summer. Arkansas has really inconsistent/weird weather. I’m always reminded to pull out the humidifiers with the first bloody nose. 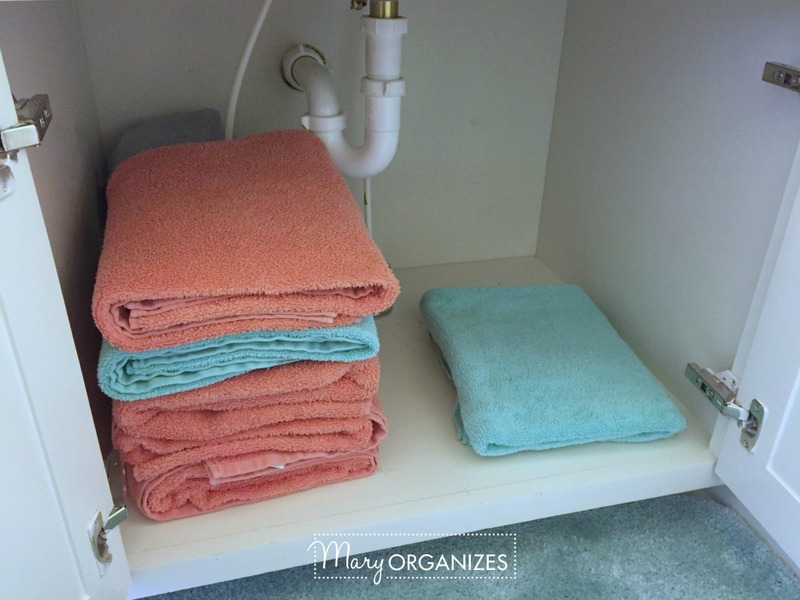 The other sink stores towels and those are extra wash cloths at the back. This is the top drawer. 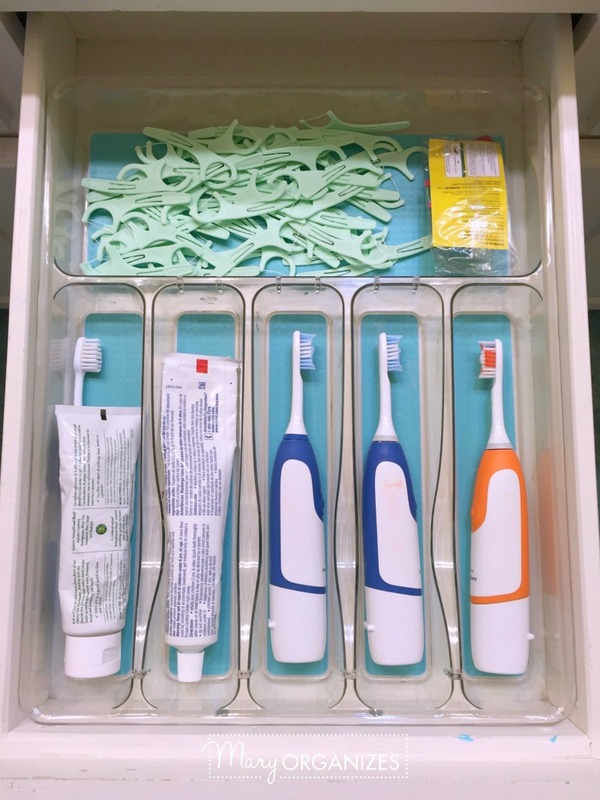 I use a Kitchen Drawer Organizer to organize my children’s toothbrushes. I run their toothbrushes or the heads of their electric toothbrush through the dishwasher on sanitize about once a week. This is the second drawer that has drawer inserts to divide hair tools from hair accessories. Wash cloths are also in here. I’m trying to teach my girls to use a fresh wash cloth each morning/night to dry their faces and then wipe up the sink area to keep it clean. Trust me, teaching this is still a work in progress. I hope it sticks before they head to college … crossing my fingers. The bottom drawer holds hand towels. The hand towels are supposed to get changed out daily for good hygiene. 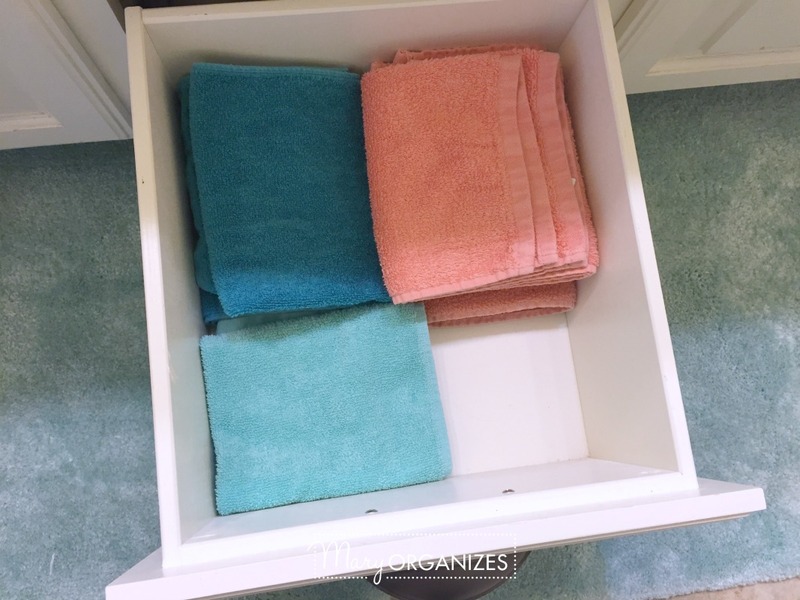 Sometimes I am confused and wonder about my math skills, because they will check “change hand towels” off of their chore list, but when I do the towel laundry, there are not enough dirty hand towels to account for how many days they supposedly changed them. Hmmm …. I wonder what is happening there? Yeah, we are working on honesty. Are you relieved to know I have regular kids too? Sometimes it can seem like everyone on the Internet has perfect children. I have good kids, but they are perfectly imperfect. The flowers in the middle were to help them stop piling random things there. It has really helped the counter stay much cleaner. 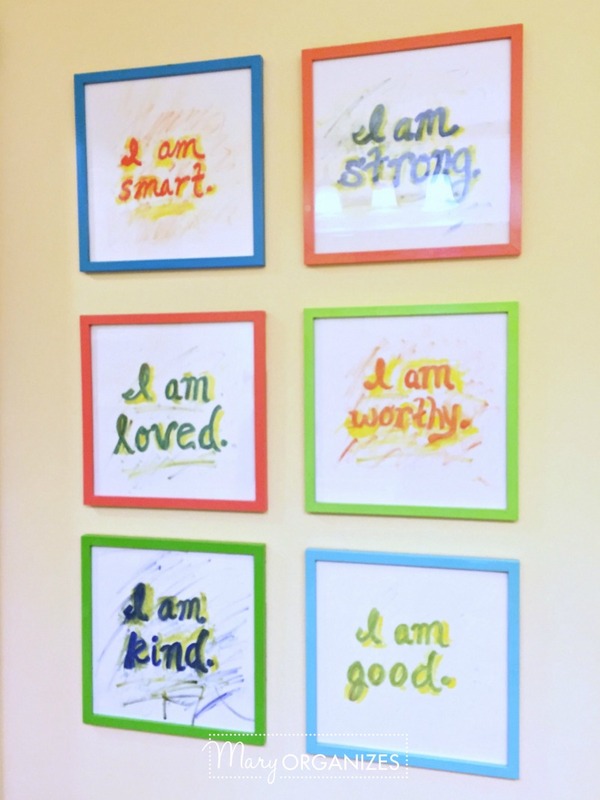 I painted these “affirmation” quotes for them, because it is so terrifying raising girls in today’s culture. I want my girls to remember these important things while they are looking in the mirror every day. When I showed them what I created for their bathroom they asked if their little brother scribbled on them after I wrote the quotes. I guess the artistic effect I was going for was not very effective – Ha! The shower curtain in here is one of my favorite things. I found it on Amazon for less than $20! I mean, it is exactly my colors and style and the perfect price. I could not be happier with how it pulls everything together. The towel hamper is from Target. They were selling the brown ones like this that I liked and I really wanted one in white for this room. I went online and searched for a white one and couldn’t find one for a reasonable price, and then one day I randomly saw this one in the Target CLEARANCE section. I felt like I won the lottery. Above the toilet, we keep extra toilet paper in the cabinets and nothing else right now. 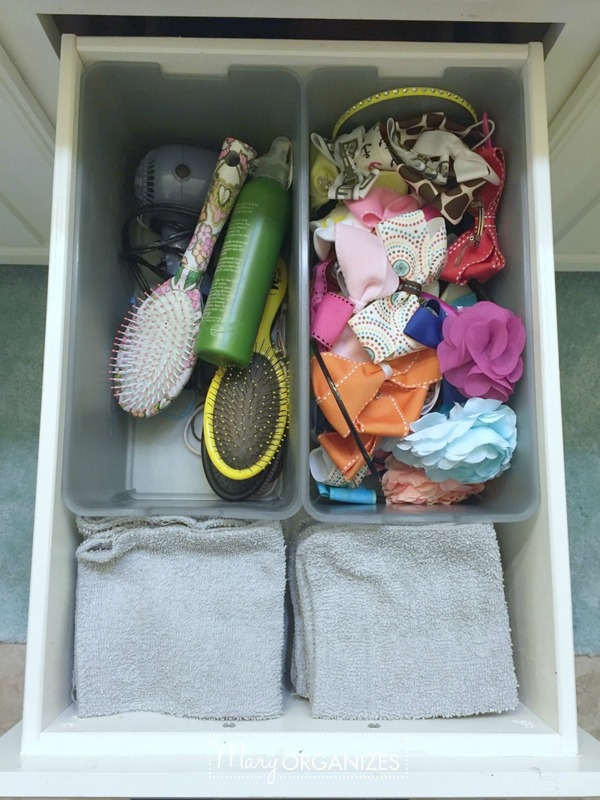 When the girls are older and have more toiletry needs, we’ll adapt. We took the builder grade towel rack off of the wall and replaced it with hooks. 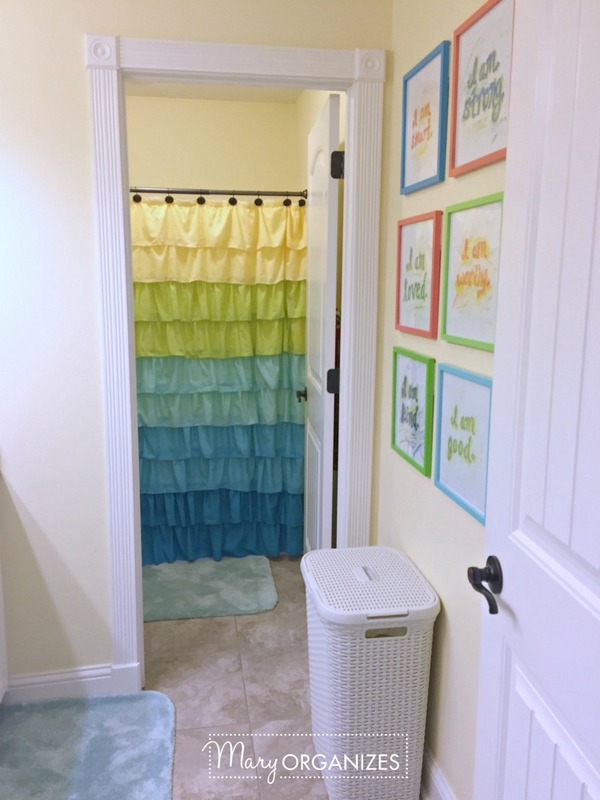 Hooks work so much better for all the things the girls need to hang in a bathroom – bathing suits and towels. 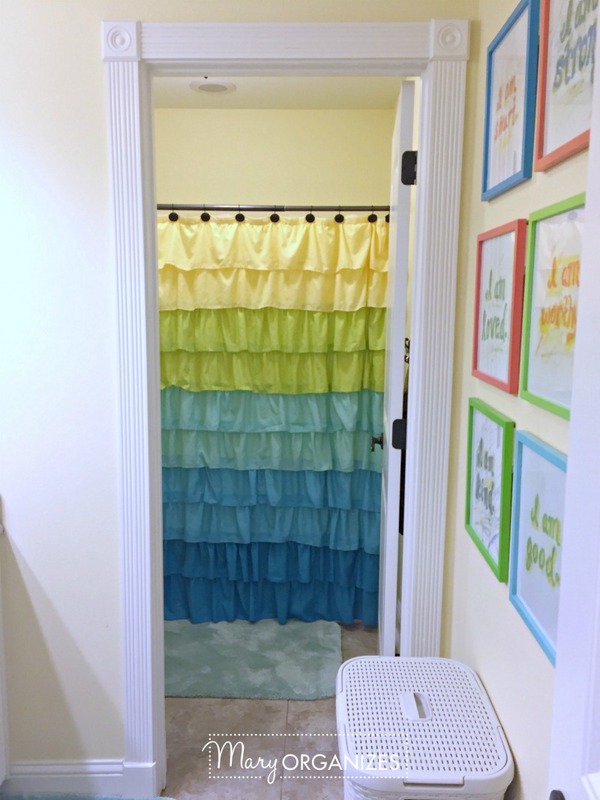 Man, I love that shower curtain. My favorite colors – right there. I hope you enjoyed the little tour of our girls’ bathroom. 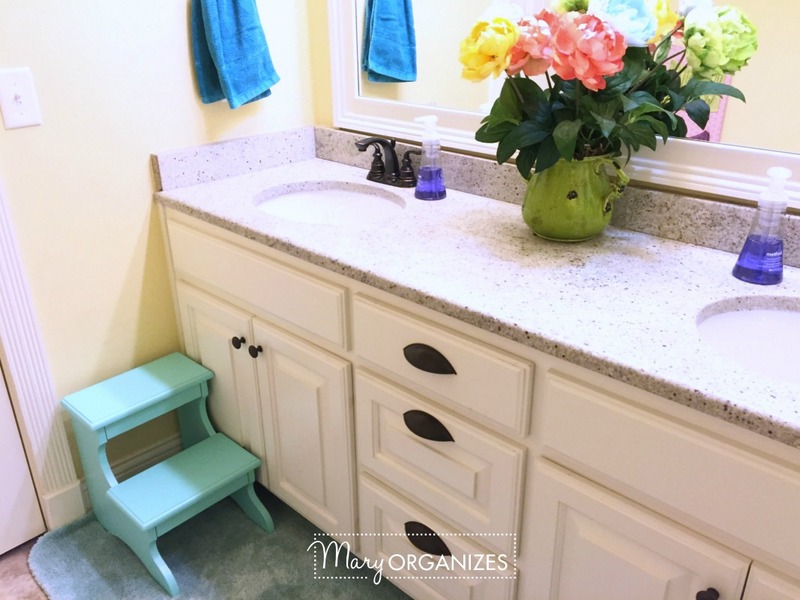 One of the main takeaways is to keep the storage in a kids’ bathroom very simple. Only keep what they need and use available. That will make it easy to clean up! OMGoodness Mary is it weird that this might be one of my favorite rooms??? Don’t get me wrong I love your entire home (and family) but the colors and everything about this room really speak to me. It makes me think of my granddaughter and how I can use some of your ideas for her room here 🙂 Once again thank you for sharing and inspiring us. Not weird at all! Oddly mine too. I used to despise it because it only made me think of toothpaste all over the counter, but the room has come so far! Loved the tour. What a lovely bathroom. I really like the flower arrangement being there in the center. I think the room would look so bare without it. Very nice and functional! Thanks for the tour. I love the inspirational comments and hand made at that. Yes all children need to hear/feel this and yet girls more so to me…..
My favorite thing is the morning routine reminder. It works to remind without nagging yet adds to the beauty of the room. You’re fantastic! 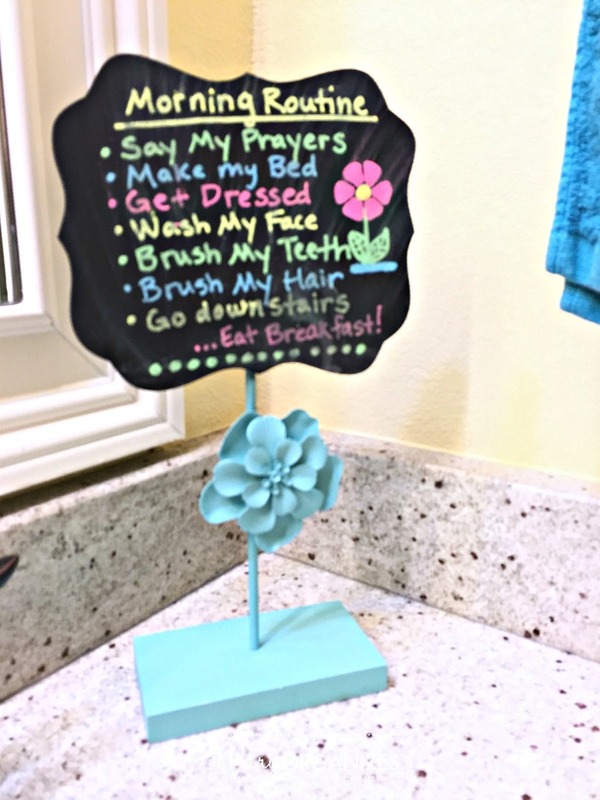 Absolutely love the inspirational phrases and the morning routine list! Thank you! And I love all of your encouragement! Seriously!! Just wondering where in Arkansas you live? I live in North Little Rock.